was to provide information to my patients about proper shoegear. 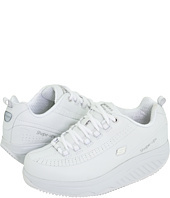 There are so many crappy shoes out there that I can’t believe this is the shoe that is getting a bad rap. I do know that the rocker bottom shoes are… Excellent. The Rocker-Bottom shoes are not for everyone! If you are elderly, have balance issues, nerve damage, muscle or leg weakness, Achilles tendonitis, Charcot foot, Diabetic foot ulcers, multiple back surgeries (several other issues) – this is NOT the appropriate shoe for you! this may be an excellent shoe for you. I have found that most patients need to ease into the rocker bottom shoes. Wear them for one hour the first day, two hours the second, three hours the third, ect – until you are in them a full day. Jumping into full activities too quickly with a rocker bottom shoe can cause some knee, hip, lower pain aggravation. There is not one shoe that is perfect for everyone! A patient’s specific foot type, pathology and individual biomechanics all play an important role in determining what type of shoe is best for that patient. The rocker-bottom shoes are typically great for patients with foot pain caused by biomechanical issues. if you broke your wrist and you go to the doctor and she puts you in a cast – you are going to leave her office feeling much better and in less pain because the fracture has been stabilized and immobilized. Now, this is a simplistic explanation but basically, less motion across the sight of injury (whether it’s soft tissue, bone or joint) will lead to less pain, less inflammation, less swelling and faster healing. If you break a bone in your foot, we as Podiatrists place patients in below-the-knee walking boots (CAM walkers) which have rocker-bottom soles. The CAM walkers allow the patient to walk with less pain while the healing occurs. if you eliminate motion across the area of pain – you will have less pain. less motion equals less pain. What’s also important is having a wide, soft toe-box, arch support (whether it’s a custom-molded orthotic or a good over-the-counter insert) and rearfoot control. I know there are people out there who will disagree with me and that’s fine. All I can say is I am a Podiatrist and this is my career. 1. There is an exception to every rule! 2. The first step is to heal the foot, the second step is to make sure the patient’s foot is biomechanically controlled with proper shoes and inserts so the problem/pain does not reoccur. 3. Most patients don’t need foot surgery! 4. If I stick to the basics – I have an extremely high success rate! I love being a Podiatrist – it’s a great career. I feel like the luckiest person in the world that I get the opportunity to help people.